빌뉴스, 리투아니아의 파브리카 호스텔 & 갤러리 | 호스텔월드에서 예약하세요. 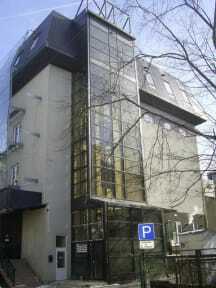 Fabrika Hostel & Gallery in Vilnius is a modern hostel located on Gediminas Avenue - the center of the city. 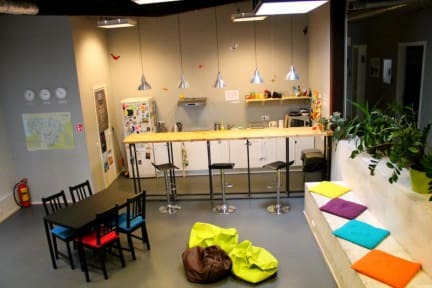 There are 10 nice and cozy rooms with high ceilings in the hostel made for living from 2 to 10 people in them. There is a laundry room with two washing machines, four bathrooms and showers. The bunk beds with lockers were designed specially for the hostel Fabrika as well as recessed light fixtures and sockets. In this hostel there is everything necessary that you need for comfortable stay. And do not forget about the design: open communications, industrial materials, stairs, furniture and bright colors – this is our own special cocktail of loft and pop art! And of course, Fabrika is not only hostel, it is a gallery as well, so the exhibitions will take place in it.